Dr. Larissa Bogomolny specializes in dentistry and cosmetic dentistry. 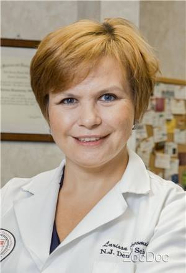 Dr. Bogomolny completed her degree at Rutgers University, and welcomes patients to her practice in East Brunswick, New Jersey. The Doctor and her	staff are fluent in English and Russian and are accepting new patients for a variety of dental visit reasons. These include standard visits, such as dental consultations, cleanings and emergencies, as well more complex procedures such	as a fillings, dentures, bridges and crowns. Dr. Bogomolny also accepts new patients for various cosmetic dental reasons, including teeth whitening. We look forward to making you a part of our practice and our dental family! © 2019 Dr. Larissa Bogomolny, DMD. All rights reserved.